I love walking in Fort Tryon Park. 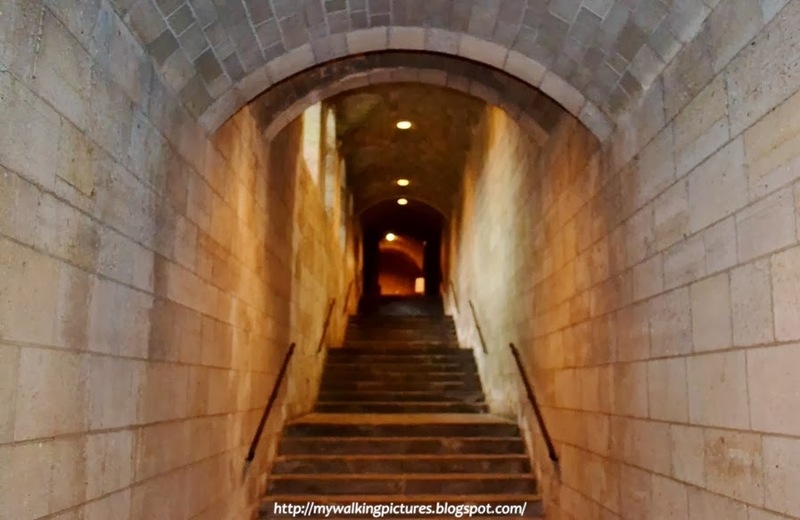 Not only because of its beautiful gardens, or its historic arches or the views of the Hudson River, George Washington Bridge and the New Jersey palisades, but also because it houses The Cloisters. The Cloisters is part of The Metropolitan Museum of Art, and is devoted to the art and architecture of medieval Europe. The Cloisters museum and gardens are located in Fort Tryon Park in upper Manhattan on four acres overlooking the Hudson River. The museum boasts nearly five thousand works of art from the 12th through the 15th Century, exhibited in a unique setting that truly transports visitors to medieval Europe. The Cloisters we know today, opened in 1928, and is a unique architectural amalgam of five medieval French monasteries. The Cloisters is currently celebrating its 75th year anniversary. It started when oil magnate and philanthropist John D. Rockefeller purchased the Billings Estate and other properties in the Fort Washington area and hired Frederick Law Olmsted, Jr. to create a park, which he then donated to New York City in 1935. As part of the overall project, Rockefeller also bought the extensive medieval art collection of George Grey Barnard, an American sculptor and collector, who had already established a medieval-art museum near his home in Fort Washington, and gave it to the Metropolitan along with a number of pieces from his own collection, including the Unicorn Tapestries. These became the core of the collection now housed at the Cloisters. Once you enter the museum, it really feels as if you've stepped inside a medieval place. These are the stone steps leading to the main lobby. Another reason why I like going to The Cloisters is that they accept whatever amount you give them as payment for the entrance fee. So, at the start of this month, I went to walk at Fort Tryon Park and, as usual, found myself walking towards The Cloisters for a visit. 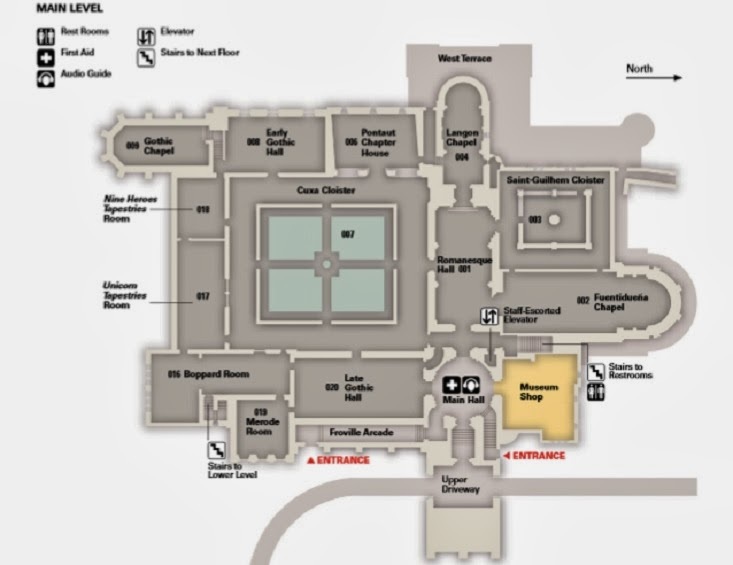 This is a floor plan of The Cloisters which I got from this link. I'll try to walk through the galleries and share some pictures I took. From the main lobby are entrances to some of the galleries and the museum shop. There are eighteen galleries in The Cloisters and Gallery 001 or the Romanesque Hall was closed at the time of my visit. The museum was setting up for its newest exhibit, Radiant Light, featuring stained glass from Canterbury Cathedral. The exhibit is from February 25 to May 18, 2014. The Romanesque Hall is dominated by two large, twelfth-century frescoes from Spain depicting a lion and a dragon. Here's a pic of the dragon I took during a previous visit. Also in this gallery are nearly life-sized figures of the Merovingian kings Clovis and Clothar flanking the entrance to the Langon Chapel, which I also wasn't able to visit due to the new exhibit being set up, but I'm sharing a pic I took from before. This entrance fascinates me, if you look closely you'll notice that all the figures of the angels around the tympanum are headless. Adjacent to the Romanesque Hall is Gallery 002 or the Fuentidueña Chapel. More than three thousand limestone blocks, lent to The Cloisters by the Spanish government in 1957, constitute the twelfth-century apse that dominates this gallery. The interior of the half dome is decorated with a Catalan fresco depicting the Virgin and Child in Majesty and the Adoration of the Magi from the church of the Virgin near Tredòs, and a magnificent twelfth-century painted Spanish wood crucifix hangs from the arch. Also displayed in the gallery is a twelfth-century Italian doorway from Tuscany, as well as other works from the Romanesque period. An entryway from this chapel leads to the Saint-Guilhem Cloister. Natural light streams through a skylight into this cloister, which was reconstructed with more than 140 fragments from the Benedictine abbey of St.-Guilhem-le-Désert. Located northwest of Montpellier, it was founded in the early ninth century and quickly became a major pilgrimage site. The exquisite limestone carvings of both narrative scenes and intricate plant motifs come from the now-destroyed upper story of the abbey's cloister, dating from the late twelfth century. Another entrance from the Main Hall led to Gallery 020 or the Late Gothic Hall, the largest of all galleries in The Cloisters. It houses paintings and sculptures of the later 15th and early 16th centuries, most of which came from large dismantled altarpieces. What caught my eye immediately after I entered the room was the large tapestry hanging underneath the windows. It is from the 1500s and is called Christ is Born as Man's Redeemer (Episode from the Story of the Redemption of Man). Essentially the series of tapestries reveals, on one hand, mankind's fall from grace and his inability to resist temptation in spite of the assistance offered by the Virtues, and, on the other, Christ's mission to reconcile mankind with God and thus achieve redemption. Also in this room is a recent acquisition, Christ as a small child holding an apple. I haven't seen this in my previous visits to the museum. At the left side of this room is an entryway which leads to Gallery 019 or the Merode Room. This is the display on one of its walls. The tapestry shown herein is from ca. 1500 and is called Scenes from the Life of the Virgin. In the next room are more tapestries, one of which is The Falcon's Bath from ca. 1400 to 1415. Such workmanship! After six centuries, the colors are still so vivid. The gallery where the tapestry hangs is Gallery 016 or the Boppard Room. The gallery takes its name from the six large, stained-glass windows that come from the Carmelite church of Boppard on the Rhine near Koblenz that date from 1440–46. Near the stained-glass windows is an alabaster altar with exquisite details. This was a gift from J. Pierpont Morgan in 1909. The Boppard Room leads right to Gallery 017, the Unicorn Tapestries Room and the pride of The Cloisters. Seven world-famous tapestries depicting The Hunt of the Unicorn adorn this gallery. Against a landscape richly woven with lush flora and fauna, the mythical beast, possessed of magic powers, tries in vain to escape the men and dogs that pursue him. A large fireplace evokes the kind of aristocratic setting in which these tapestries, first recorded in Paris in 1680, originally would have been situated. Shown above are four of the seven tapestries. The one at the center is called "The Unicorn is Killed and Brought to the Castle" and the small one hanging on top of the entryway is "The Unicorn is Captured by the Maiden" or The Lost Unicorn Tapestry since only two pieces are what remains of the original tapestry. It was damaged during the French Revolution when the tapestries were looted from the chateau of the La Rochefoucauld family who owned the tapestries for several centuries. If you want to learn more of the Unicorn Tapestries, this link has an in-depth article on the different tapestries, including the flora found on them. Very good read! When I was there at the start of this month, one of the tapestries, "The Unicorn is Found" was on top of the table, probably for cleaning and/or maintenance. The tapestry hanging on the left of the above photo is called "The Unicorn in Captivity", I think this is the most popular of all the seven Unicorn tapestries. The Unicorn in Captivity may have been created as a single image rather than part of a series. In this instance, the unicorn probably represents the beloved tamed. He is tethered to a tree and constrained by a fence, but the chain is not secure and the fence is low enough to leap over. The unicorn could escape if he wished but clearly his confinement is a happy one, to which the ripe, seed-laden pomegranates in the tree—a medieval symbol of fertility and marriage—testify. 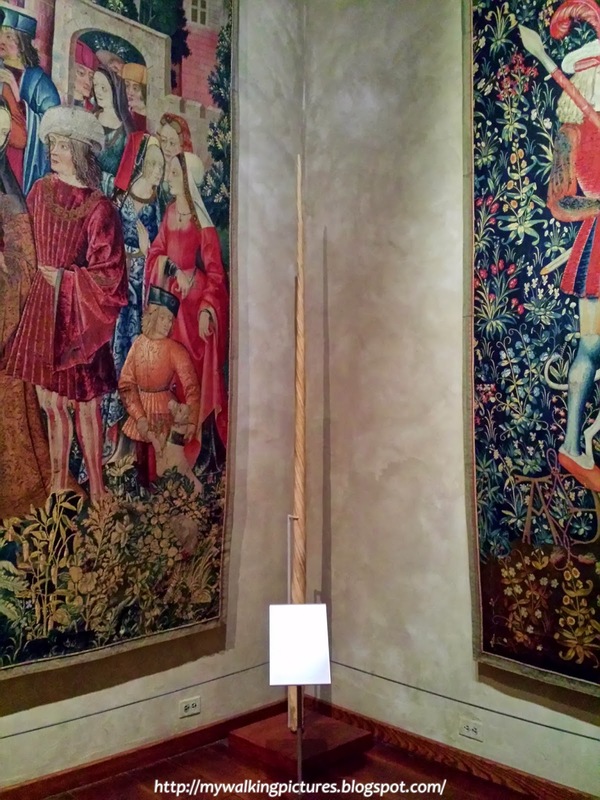 Nestled at one corner between two of the tapestries is a tusk from a narwhal, the unicorn of the sea. It was taller than me! The entryway beneath the Lost Unicorn tapestry leads to Gallery 018, the Nine Heroes Tapestries Room. A series of tapestries devoted to Nine Heroes of the Middle Ages celebrated in a fourteenth-century poem dominate the room. From the original ensemble, five survive: David and Joshua of Hebrew scripture; Hector and Julius Caesar from Classical tradition; and Arthur, the legendary king of England. Thought once to have belonged to Jean of France, Duke of Berry, these are among the earliest tapestries to survive from the Middle Ages. These galleries have doors which open to the courtyard or the Cuxa Cloister, the open air courtyard was reconstructed with fragments from the twelfth-century cloister of the Benedictine monastery of St-Michel-de-Cuxa. Since it is winter, the garden was closed and clear glass covered the cloisters to keep the cold out. This room opens to Gallery 08, the Early Gothic Hall. The Early Gothic Hall houses works from the thirteenth and fourteenth centuries. 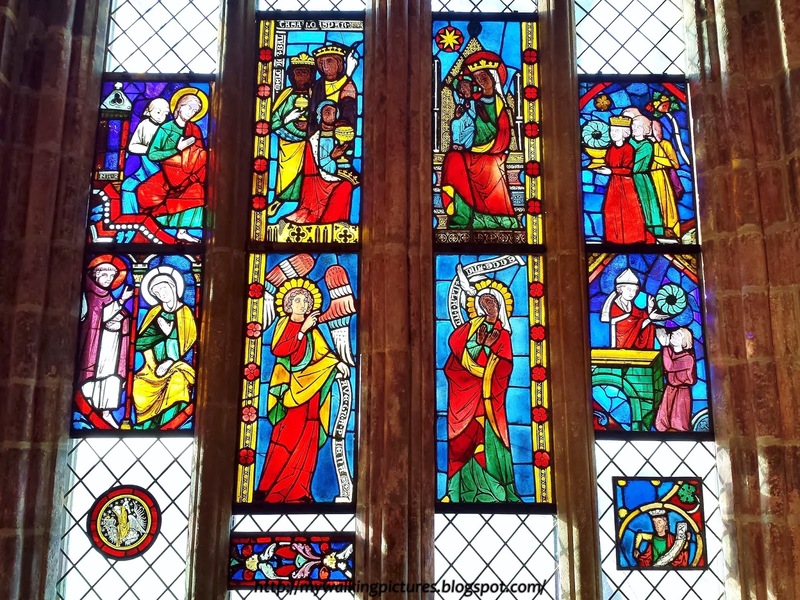 The three thirteenth-century limestone windows overlooking the Hudson River are filled with Gothic stained-glass panels from the cathedrals of Canterbury, Rouen, Soissons, and other sites. Also on view are French, Spanish, and Italian sculptures of the period, as well as an altarpiece depicting the Adoration of the Shepherds painted by the Sienese artist Bartolo di Fredi about 1374. I love the stained glass windows. A few short steps down leads to the Gothic Chapel and the lower level of the museum. 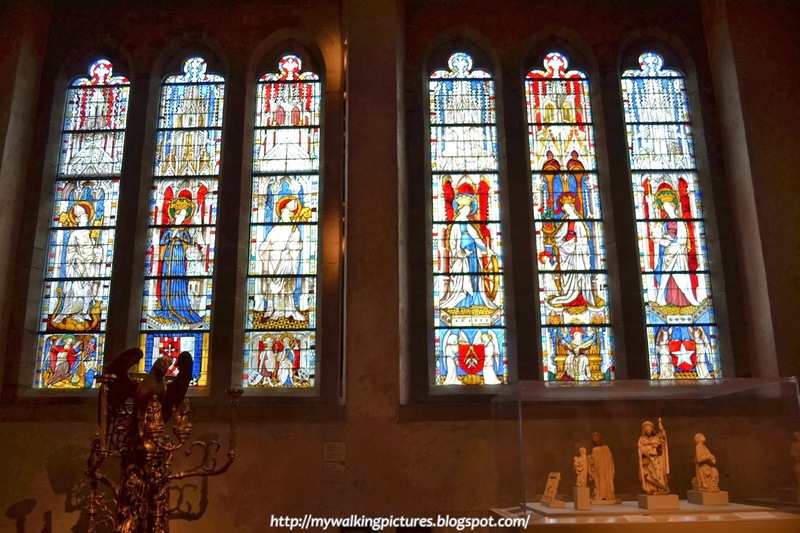 This gallery takes the form of a thirteenth-century chapel, while its tall windows are filled with brightly colored fourteenth-century Austrian stained glass from the church of Saint Leonhard in Carinthia and the castle chapel at Ebreichsdorf near Vienna. The chapel opens to the Glass Gallery. The Glass Gallery is so designated because of the large collection of fifteenth- and sixteenth-century silver-stained roundels installed in the nine lancet windows looking into Bonnefont Cloister. The gallery also features polychromed sculpture of the later Middle Ages along with small tapestry hangings and a painted triptych. Small-scale sculptures in wood, stone, and terracotta are displayed in cases, along with a variety of decorative art including glass, ceramics, and metalwork. 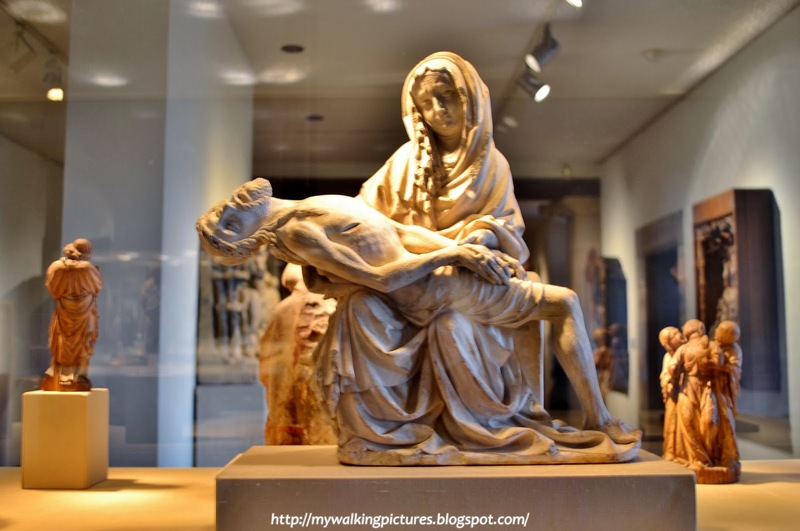 There are a lot of sculptures of Mary and the Child Jesus in the gallery. The big ones are placed near the wall while small ones, like this one in the photo, are displayed inside cases. Here's one of the big sculptures near the wall, with Mary and Jesus in almost the same position. Also at the lower level is the Treasury. Works of art in precious materials on view in this gallery and in Gallery 013 convey the luxury and artistic sophistication of medieval artists and patrons. I am in awe of the workmanship of the artists from many centuries ago. Most of the items in this gallery are small and intricately carved from ivory. I can just imagine the time and effort spent on one item. 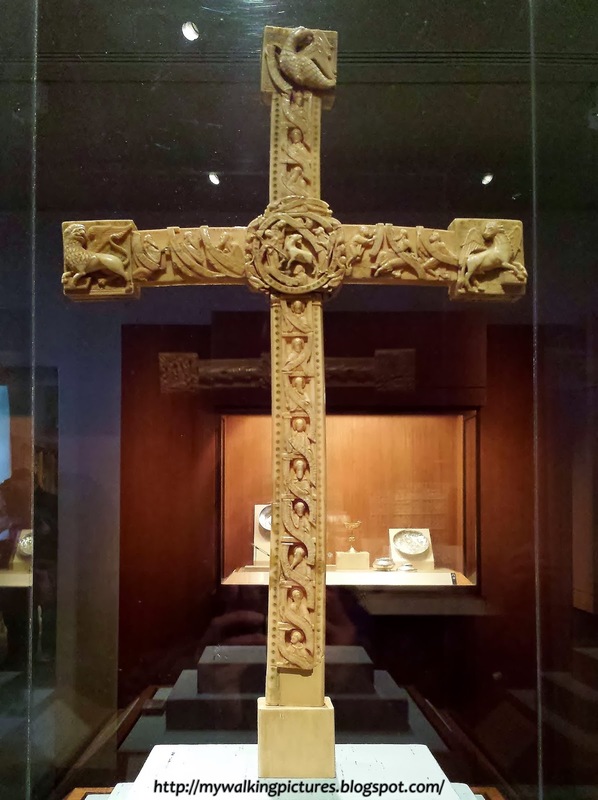 Also in the Treasury is the Cloister Cross, which is carved from walrus ivory. The carvings which cover both front and back sides include ninety-two intricately carved figures and ninety-eight inscriptions. The figures, each of which is only about one-half inch tall, illustrate a number of Biblical scenes, and on the back a number of the Old Testament prophets with banderoles containing quotations from their books. The Glass Gallery opens to the Bonnefont Cloister but since it was the middle of winter and the open cloister overlooks the frozen Hudson River, I didn't go out to take pics, but I have one of the adjacent cloister, the Trie Cloister. Elements from the cloister of the Carmelite convent of Trie-en-Bigorre, near Toulouse, were dispersed after the French Revolution. Today some of these elements, along with pieces from nearby monuments, constitute this intimate space. 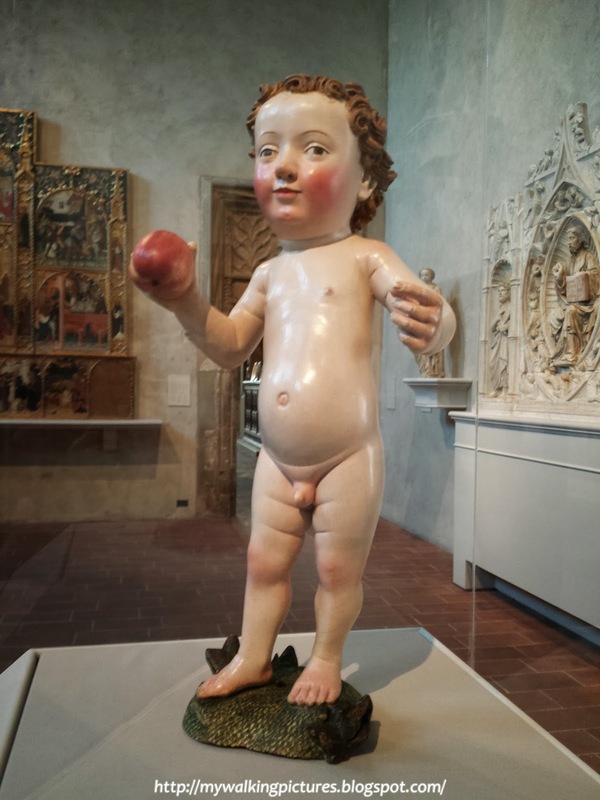 I hope you enjoyed the little tour of The Cloisters through my pics, and I hope all of you can come and visit one day and see for with your own eyes the treasures inside this beautiful museum. I started the year by ringing in 2014 in Times Square. It was great to be there with my family and welcome the new year in the middle of the city that I love. As I've done in the past years, I walked on weekends, usually in Central Park. Here are my favorite pictures taken during my walks in January. New York City had its first snow of the year on January 3 so when I walked in Central Park the first weekend of 2014, the park looked like a winter wonderland. The kids and the young at heart had a great time sledding in the park. Even Alice and friends were playing in the snow. When I reached The Reservoir, it looked like a mirror with its frozen waters reflecting the sky above. The following day, Sunday, I visited Brookfield Place. I was also in the area during the Canstruction Exhibit last year. The light fixtures of the place looked great, especially at night. I also passed by the pedestrian pathway which opened just last October, the WTC West Concourse which leads to the WTC Transportation hub. There was no snow the following weekend but it was a foggy day in Central Park. The mist definitely added to the park's charms that day. At the Harlem Meer, the mist was easily seen rising out of the frozen waters. Light mist was also swirling around the waterfall area inside The Loch. I love it here, it's so peaceful and beautiful. The following day I had a short walk in Battery Park. It's always a pleasure to watch the day end and see Lady Liberty across the New York harbor illuminated by the sunset colors. Battery Park is currently undergoing renovations but I was surprised to see that The Sphere has been moved to another location. This time, it was placed near the Korean War Memorial which is located at the west end of the park. The new location has allowed visitors to view the memorial and the Sphere with One World Trade Center, rising tall just several blocks away. After Battery Park, I proceeded to Brooklyn Bridge Park to take some night time pictures of lower Manhattan. Ah, New York, you always look pretty at night with all the lights. Brooklyn Bridge Park has also a great view of the Manhattan Bridge. It was shining brightly that night, the lights reflecting on the water looked like jewels. Central Park celebrated its third Ice Festival on January 18. This time it was held at the Bethesda Terrace where the Okamoto Studio carved a scaled ice version of the Angel of the Waters. Last year the festival was held at the Belvedere Castle and a scaled castle in ice was the main attraction. On my way home from the Ice Festival, I passed by Bow Bridge, it looked so pretty with the colorful sky above. The following day I dropped by Roosevelt Island for a short visit. The sun was starting to set when I neared the southern end of the island where the Four Freedoms Park is located. It was cool to see the sun "set" on the buildings of Manhattan across the East River. At the other side of the East River facing Queens, the iconic Pepsi sign along Long Island City's waterfront stand among the new buildings in the area. When I was in the island last spring the building at the back of the sign was just several stories high, its lower eight floors were recessed 12 feet to keep them 45 feet distant from the back of the sign. The linden trees at the Four Freedoms Park were all leafless but they still stand guard over FDR's huge bust at the center of the park. I can see One World Trade Center peeking at the right side of the picture. It was already dusk by the time I left the island. Here's a shot I took as I walk towards the subway station, the Upper East Side shining across the river. It snowed again on the last Saturday of January when I walked in Central Park. The park carousel was closed for the winter season but it looked so charming when viewed from the Playmates Arch. The ice carvings from the previous week's Ice Festival were still at the Bethesda Terrace area. A lot of visitors were admiring the ice sculptures, even Charley the Lhasa Apso had his picture taken with the angel. By the time I reached the Bow Bridge, snow has already covered its walkway. I love this bridge, it looks beautiful no matter what angle. 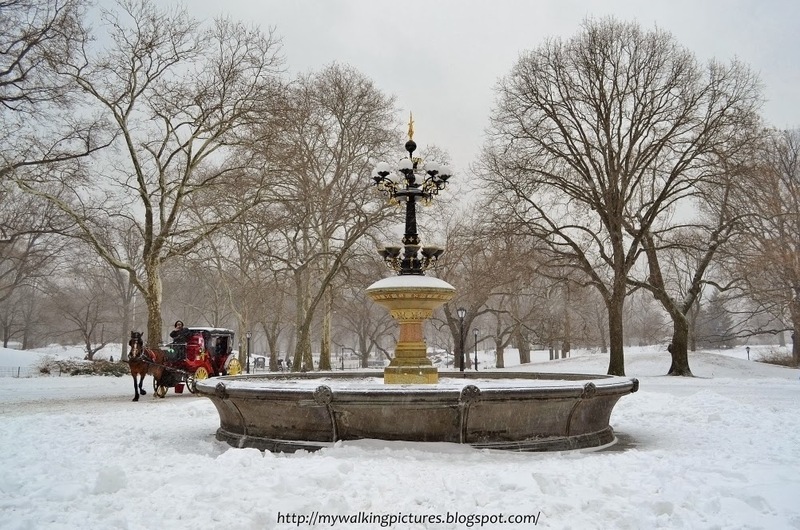 From the Bow Bridge and Lake area, I took the pathway up the Cherry Hill towards the fountain area which is usually full of horse carriages, as this is one of their viewing spots in the park. This looks magical! On the last Sunday of the month I walked along The High Line. There were only a few park goers as the cold that day was so numbing but the park was looking peaceful and beautiful. It was even glowing from the reflection of the setting sun! And to top it all, I saw a marriage proposal right by the park. How sweet! And she said yes! What a great way to end my weekend walks for the first month of the year.